Time for a very traditional action film. By that, I mean that this film basically checks off all of the boxes that you would expect for an action movie but it doesn’t really do anything original. It’s a reasonably good film, but one that does have some issues. You can see how it likely cuts out a bunch from the book as they don’t explain much. I’m fine with no explanations as it’s fun just filling in the blanks on your own and finding out fun facts on Reddit. The main character is annoying though and Elba’s character probably should have been the lead without a sidekick. Lets take a step back and look at the plot real quick. A kid named Jake has been able to see into another world lately. He can sort of see the future, past, and alternate realities. Unfortunately he’s not wise enough to keep this to himself and gets so obsessive about it that everyone starts to believe he is crazy. So when the aliens actually do come in to take Jake down for the count, nobody believes him. He manages to escape to the other world where he meets a traveling hunter named Roland who wants to destroy this guy named Walter who murdered all of his friends. Roland doesn’t want to make any friends, but Jake was never going to give him an option anyway so it is what it is. The other world is basically just a large desert planet so there isn’t much to look at. The film is visually uninteresting so the best scenes are when they head back to Earth. Any scene with the kid and his parents is annoying, but the characters wandering around and eating hot dogs is a little more passable. The film doesn’t have a whole lot of humor as you may expect but when it does you just want Jake to stop talking and overreacting. As you can probably tell I didn’t like Jake right from the start. It’s pretty common for the young protagonist to let everyone know that he has hallucinations and as a result nobody trusts him. It just seems like Jake should have taken a hint early on that nobody else was seeing these things or noticing that the world was going to end. It’s not like Jake even knew this either. All he knew was that he was having strange dreams and should have thought of a plan himself. Keep acting normal and play the game until he gets a better hand. Then Jake is just a liability throughout the adventure even after meeting up with Roland. He tries to guilt trip Roland and just doesn’t seem like the kind of companion you want on your team. My review may be a little rough on the poor kid, but I think he just wasn’t ready for this level of combat. It’s like I always say, the kids should stay at home while the grownups handle the fight. Roland is a decent main character but he does come off as rather generic. I can roll with him deciding to take down Walter as a last act of revenge considering that saving the world is pretty out of the question at this point. The problem is, you can take him about as seriously as Drax The Destroyer since it would be an extremely simple matter for Walter to defeat him. Walter has advanced telekinesis at his disposal. While his mind games don’t work on Roland, he still has many ways to destroy him. Roland is fighting a hopeless battle in which he is greatly outnumbered. Naturally you want to put the hero in a bad spot for most situations, but once it gets too absurd you can only try to predict what form of plot hax will help him out. Walter is the big villain and the only other character of real importance here. He’s a pretty charismatic guy and probably the most interesting character here. He has a pretty solid plan and came close to destroying everything. While he needs to learn how to play the match ups a little better and camp more against someone with a gun, he seems reasonably intelligent. You always want to have a good villain to make a film more exciting so having him here was definitely a smart move. There are other supporting villains, but they are really just here to reinforce Walter’s image. We do get a giant monster, but considering it wasn’t bulletproof you knew who the victor was ultimately going to be. The film can be rather dark as the villains have already captured most of the kids and use them to destroy the tower. Fortunately the film doesn’t overdo it in focusing on this angle. You get the feeling that this movie exists in a universe that is surrounded by a lot of dark elements but keep those in the books. We get the atmosphere which is the important part. It’s not a fun movie by any stretch and it’s serious throughout, but at least we don’t get much forced comedy or subplots. As I mentioned, the supporting characters never get to do much so the screen time is always with the leads. The pacing is fairly quick and the film never drags on. While the ending is rather sad, the characters don’t dwell on it and are actually really happy all things considered. It’s likely their way of coping which makes sense. If you do like the supporting characters then you should prepare yourself. The film is rather mean spirited towards anyone who hangs around the main characters. That’s actually a bit of a trope you’ll notice after a while. If you help the main character then you’ve likely just triggered a bunch of death flags. They can’t be bothered to come back and save you so it’s definitely Game Over at that point. They at least helped out in the long run so that’s good. 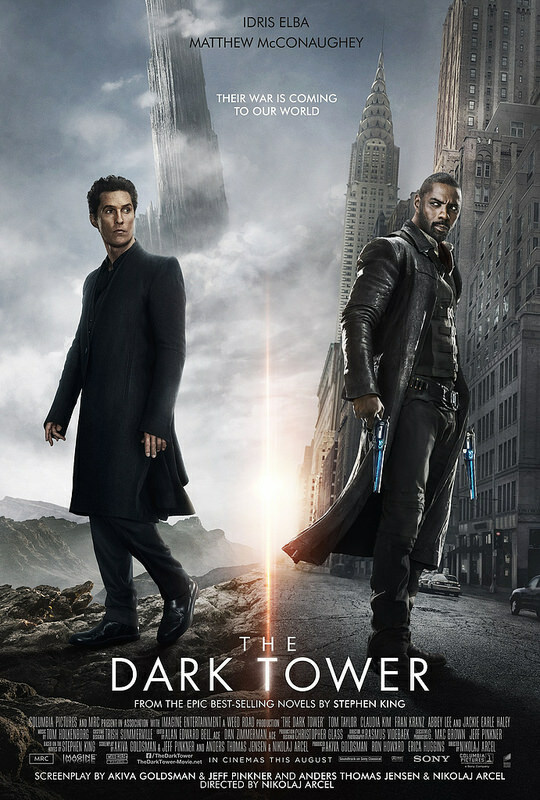 Overall, There’s not much reason to watch The Dark Tower. There’s no one area that you can point to and explain why it did this well. It doesn’t do anything particularly well, but I suppose it doesn’t do anything particularly bad either. It’s just an average action film and one that will hold your attention well enough after you finish it. It didn’t really leave much of an impression on me, but I wouldn’t mind a sequel I suppose. Just give the heroes some power ups so they’re not just random people with guns. It’ll make the fight scenes against super powered villains a little more believable. If you’ve run out of fantasy films and want to see another one then this is a reasonable film to pick up. Who knows, maybe you’ll enjoy this new world. This entry was posted in Live Action Movie Reviews, Live Action Movies, Reviews and tagged Action, Dark Tower, Film Review, Idris Elba, Movie Review, Review, Sci-Fi, Stephen King, Supernatural, Thriller by dreager1. Bookmark the permalink.